The Lot is one of the best kept secrets in France, less well known than the Dordogne it is equally if not more beautiful. The upper river cuts its way through the limestone plateau or 'causse' in a series of spectacular bends with cliffs on each side. After Cahors the valley opens up, and the river winds its way through walnut groves and vineyards interspersed with quaint villages of old stone houses. Winding up the valley sides, there are tantalising glimpses of the river below, a sense of history is everywhere. 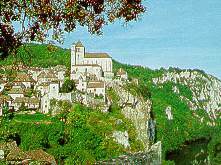 Visit prehistoric caves with amazing paintings, discover ancient fortified towns and villages perched on hill top sites such as St Cirq Lapopie and Rocamadour and the bastide towns such as Tournon d'Agenais . These have a central square and the classical pattern of narrow streets intersecting at right angles. Cahors is the principal town of this area and it was a flourishing commercial and university city in the middle ages and became famous in the courts of Europe for its wonderful wine. In Cahors itself you can still see the l4th Century "Pont Valentre", a remarkable mediaeval military bridge which has a fascinating legend behind its building. The Lot is a wonderful place to enjoy walking, fishing, riding, tennis and there are lakes for swimming and watersports, However, this is first and foremost an area for those who want to relax and absorb the life of the countryside which continues at the pace of another era. Perhaps the greatest pleasures are simple. The local markets are wonderful, with an amazing array of fresh fruit and vegetables. You can make visits to farms to buy regional produce such as foie gras and confits which are still made on the property. This area has a number of top-class restaurants, like the "Gindreau" at St Médard Catus or "Chez Marco" at La Magdelaine. At the other end of the scale there are some of the best value restaurants still to be found in France. 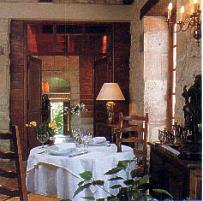 The cooking is typical of the south-west, and always very fresh and delicious. A visit to the Lot would not be the same without sampling the Cahors wine. The Cahors vineyards stretch from the town of Cahors in the East to Mauroux in the West, mostly on the south side of the river. The vignerons are proud of their wine and many are open during the summer months for wine tastings. A visit to the annual wine fair in Puy-L'Evêque at the beginning of August is a wonderful way to test your tasting skills. The Lot has a temperate climate which is dominated by the Atlantic and so enjoys relatively mild winters and long spring and autumn seasons. Nevertheless, being so far south, the summers can be very hot indeed and the overall climate is drier than the Dordogne. It is an ideal area for a relaxing out of season holiday. Want more information for your visit?